Part of the fun of kayaking is the paddling. Part of the pain of kayaking is the … paddling. If you’re not in shape, or you’ve been doing it too long and you just don’t want to do it anymore, or maybe you never did see it as all that much fun, but you like the idea of kayaking, a fast-growing little Hood River company is serving up one answer. It’s called WindPaddle, and it’s the brainchild of Nick Mark Wiltz. 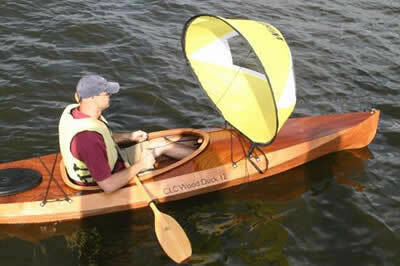 As the photo here shows, WindPaddle works to tap the wind so that you kayakers don’t have to paddle quite so much. It’s a lightweight, easily launched “sail” — more like a wind sock, really, to my eyes — that works great for down-winders. “In the last 25 years, there have been two new entries into this market,” Wiltz told me when we chatted the other day. Oddly enough, both are in Hood River — his company, and the Kayak Sailor. The latter takes a more traditional approach to tapping the wind for a kayak boost — upright mast, boom, etc. Kayaking purists, of course, scoff at such notions. Getting a free ride? Pshaw, let’s muscle-up, gang. If, however, you don’t mind admitting that a little carbon-free assist to your destination isn’t such a bad idea, the WindPaddle is light weight — 13 ounches vs. maybe 3 pounds for other rigs — and economical — $175 or so vs. maybe $350. Simple to install, too. It just clips into place.No bolts, no holes, no hassle. Wiltz has an engineering background, worked for Luhr Jensen at the Port for years, then as a chemist, then rigged sailboats. He’s been playing with this idea, in his garage on the Heights, for five years. Three years ago, he jumped into the market and sold maybe 45 sails. When you produce 4,200 units, that’s exponential. He’s looking to expand, and move — locally. That may be the best news of all: Local roots, local branches. Sail away, Nick. The City of Hood River — by way of city council vote — agreed to join the throngs rushing Google for a chance to pilot a proposed 1 gigabit fiber optic network. How much is 1 gigabit? Technically speaking, that’s a whole friggin’ pantload of gigas and bits. Like Kibbles & Bits, only different. Dave Russell, who works for Summit Projects, told the council about the request for information at Monday night’s meeting. He articulated some of his visions for how such a huge data pipe could benefit the local economy. I found myself lying awake later that night, imagining my own apps. We now have no car dealership. Imagine a place where you could take a virtual tour of any car you wanted, in a surround screen environment? Imagine medical apps — remote diagnosis, for instance. Imagine education apps — college course content and real-time group collaboration — with everyone scattered miles apart, linked through their computer’s web cam.